Reading about how our readers approach their tech/workflow combinations has been both enlightening and a pleasure. You guys are smart — and we appreciate you taking the time to articulate your personal systems with us. 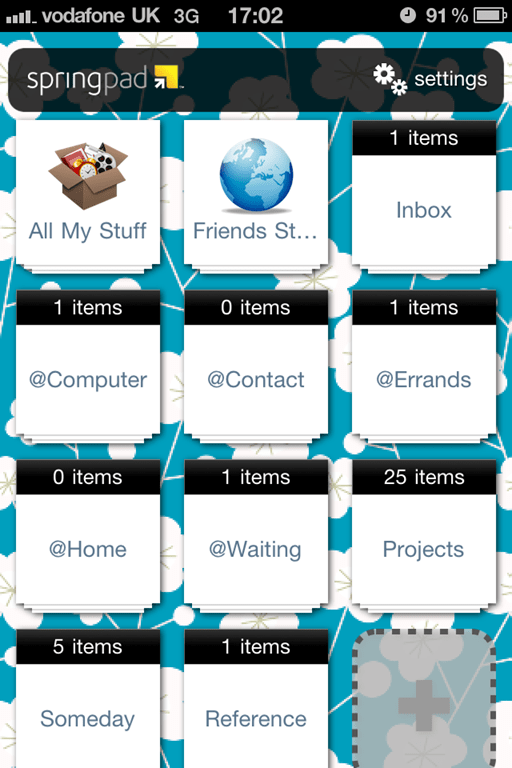 Nina Kefer has already shown us two GTD setups in applications she has experimented with. Her Beauty and Brains: Getting Things Done™ In Style series has put an emphasis on mobility (from the iPhone), a beautiful user interface, and above all, functionality. She wraps up her series today with her own take on and review of GTD in Springpad (Bobby put together a slightly different approach here), and a final conclusion as to which GTD setup ultimately works the best for her – and might for you, too. In my previous articles (GTD With Awesome Note & Evernote, GTD With 2Do & Toodledo) I looked at different combinations of front and back ends to Get Things Done. 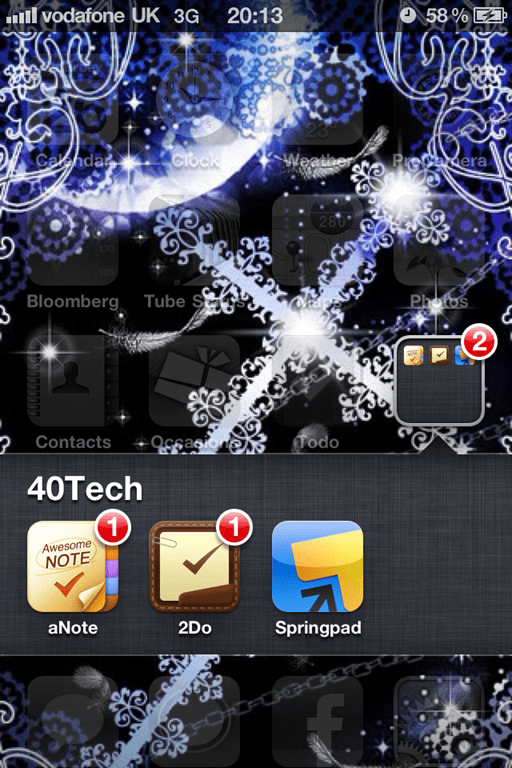 However, if you’re after the seamless sync that only native apps can deliver you may want to consider Springpad. 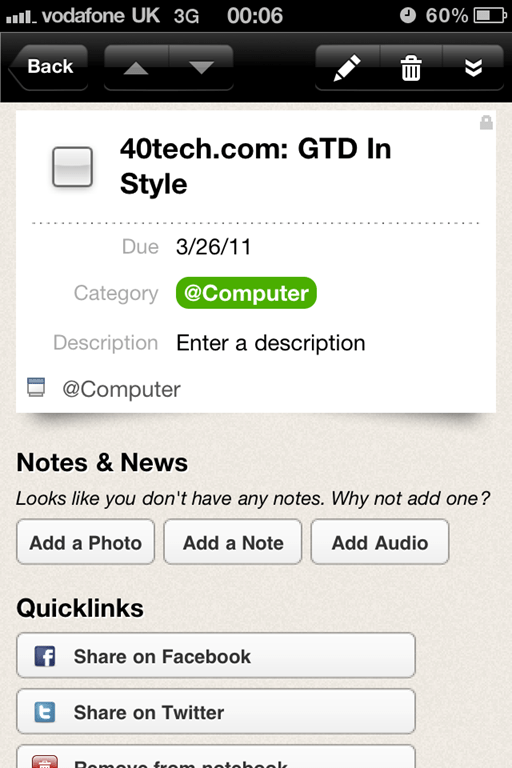 Like Evernote, with which it is often compared, it is basically a virtual filing cabinet, but its dedicated task management features give it an edge over Evernote, whose tick boxes and tags can be used for task management, but which needs a dedicated front end like Awesome Note or Egretlist to schedule them and set alerts on your phone. Springpad seemed to offer everything that I missed in Evernote – scheduled tasks and events, sorting by due date, reminders, sync with Gmail and Facebook contacts and with Google calendar – and the recent Evernote update, which emphasised social networking at the (temporary) expense of advanced features like saved searches, had widened this gap further, so I decided to give Springpad a go. Since the notebooks are quite big for the small iPhone screen and it isn’t possible to move or delete the Friends Stuff folder which occupies a prime location in the top left corner I had considered creating a Next Action notebook and making tags for the contexts, but then I would have had to open the notebook each time to check how many tasks are waiting in each context. Moreover, tags appear last in the list of options for filtering the “Stuff” in your notebooks and aren’t sorted alphabetically but by popularity, i.e. the tags you use most often appear at the top and the ones you use least are at the bottom. Using tags for contexts would have therefore involved a lot of scrolling and looking around and I prefer to have as straight forward a setup as possible. Fortunately, though, I’m able to view all my nine folders without scrolling, which wasn’t possible with Awesome Note or 2Do. Springpad also has categories, which should be the closest equivalent to contexts, but it is not possible to filter by category and categories are only displayed within tasks. To my mind, having to open every task to check its context in order to be able to complete as many tasks within that context as I have time and energy slightly defeats the object. Within each notebook you can add a multitude of items: a note, a task, an event, a contact, a check list, a packing list, a shopping list, an alarm, a bookmark, a business, a restaurant, a wine, a product, a book, a movie, a TV show, a music album, a recipe or you can look something up on the internet. You can attach pictures and other files to notes, share tasks via email, Twitter or Facebook or make them public on the web. The iPhone app even includes a voice recorder and barcode scanner. However, it is not possible to share notebooks with selected people or teams without making them public – which means sharing them with the world. On the web, a task can be scheduled, given a category or tag, have an alarm set and have a note, link, photo or other file attached. For special emphasis it can also be flagged. 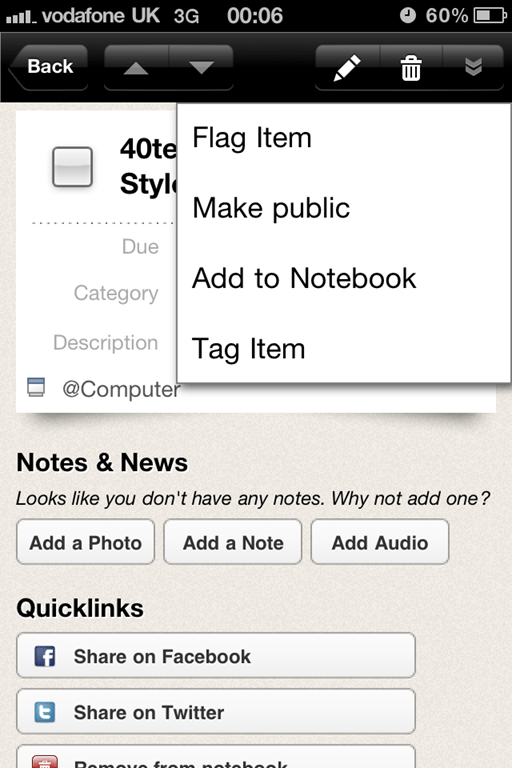 On the iPhone, a task can be scheduled, flagged, given a tag or category and have a note, photo or audio file attached. Tasks can then be moved freely from folder to folder as you work through them and sorted by due date, date added, category and name, both on the web and on the phone, and filtered by tag, alarm or flag. However, there are no recurring tasks and no plans to implement them. If a task is recurring you have to create it as an event, but this is only possible on the web, not on the phone. 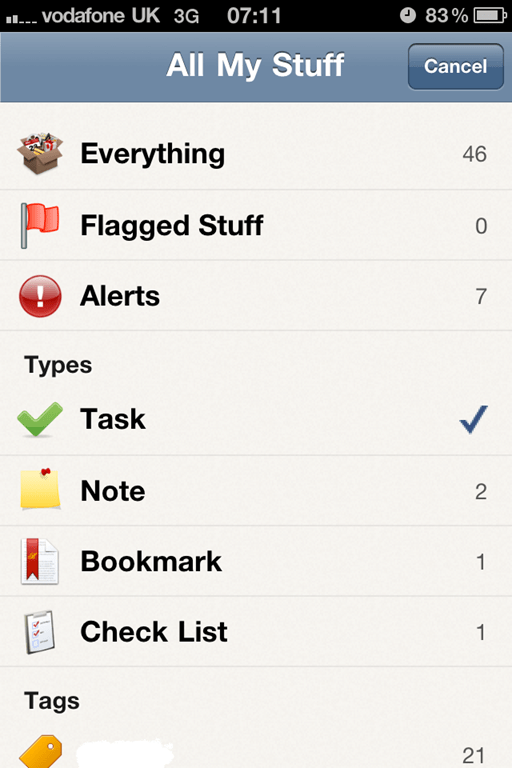 Also, Springpad doesn’t support projects or subtasks, so the closest equivalent is to create a checklist. While this is a more functional solution than the Awesome Note method of listing the subtasks in the body of the task/note, only the parent task can be scheduled, so you still have to create separate to-dos for each subtask as you work through your projects. You can create contacts in Springpad, either from scratch or from existing contacts in Gmail or Facebook, but unfortunately it isn’t possible to link them to a task or event — to remind yourself to ring someone, or book a hotel, for example . It also doesn’t seem to be possible to add hotels or restaurants from Gmail contacts. They can only be created from scratch or by using the “Look it up” function, and for this to work you first have to tell Springpad which city to search for in “Add Nearby”, otherwise it will return US results or no results at all. Searches for wines, books, movies, albums or other product info are equally temperamental. For example, I used the barcode scanner of the iPhone app to scan UK versions of American films and while it recognised the DVDs and correctly displayed the price in pound sterling, it only searched US retailers and often came back with no results. By comparison, Red Laser found dozens of UK retailers, sorted by cheapest price. Reminders are a bit tricky too. For example, if you want to add a reminder to a task you must do this before selecting a due date, otherwise the only choice you will be given is to set a reminder one or more days prior to the due date. The only available types of reminders are email or, for US residents, SMS. The iPhone app doesn’t offer local alarms, which means that you cannot disable data roaming if you want to receive reminders while travelling abroad. As a frequent traveller, I often depend on this app because internet access may be unreliable or not available at all, so I incur roaming charges for receiving reminders and depending on the country and phone plan this can be very expensive. It also means that reminders don’t work if the phone is in airplane mode. Finally, there is no icon badge to indicate overdue tasks; you have to open the notebooks within the app and tap on Alerts to see if any tasks are overdue or check your inbox for reminder emails. The feature I was most excited about was the sync with Google calendar because mine syncs with the iPhone calendar, so I was looking forward to a fully integrated task and event management solution. Unfortunately, the way this is implemented in Springpad is not very practical. Springpad doesn’t actually sync with your existing Google calendar. It creates a new separate calendar, which is perfectly fine if you don’t want your tasks – which appear in Google calendar as all day events – to clutter up your regular event calendar. However, tasks can’t actually be synced to this calendar, only events can, and since these events appear on the Springpad calendar they don’t sync with my iPhone calendar because it syncs with my regular calendar, i.e. the one that is connected to my Gmail. The only workaround appears to be to copy events manually from the Springpad calendar into my regular calendar, so I might as well create them there to begin with. I can add tasks that have due dates to my regular calendar via the iCal feed but, as with events, this is only possible on the web and these tasks then aren’t visible in the iPhone calendar either. Since there is no calendar view within Springpad, not being able to sync with the iPhone calendar means that here is no offline calendar view for your tasks. I understand that Google doesn’t allow sync with Google tasks, but other task managers are able to sync both events and tasks to Google calendar via the iPhone calendar, so it should be possible to implement a more satisfying solution. At first glance, Springpad seems to offer everything that I am missing in Evernote – scheduled tasks and events, sorting by due date, reminders, sync with Gmail and Facebook contacts and with Google calendar – but upon closer inspection it doesn’t deliver, yet. It is brimming with possibilities and perhaps one day it will become the one-stop solution for task-and-everything-else management I dream about. However, currently there are too many shortcomings to make it a viable option for anything but casual use and its US focus severely limits its usefulness for international customers. Until these issues are addressed, it will remain just another virtual filing cabinet for me. So which of the other systems did I choose? I found Awesome Note to be the most intuitive and straight forward of all the apps I tried; it literally felt like shuffling magic paper from multi coloured folder to multi coloured folder. However, while I continue to rely on Evernote for filing away reference material, I discovered that for GTD I prefer a framework that is specifically targeted at task management, such as Toodledo. In combination with 2Do, I have yet to come across a task or project that I’m unable to process down to the necessary detail. Will I stick with it? Who knows. If Awesome Note found a way to use Evernote’s tags and sync with Google calendar, and Evernote brought back saved searches and list view, I may well be tempted back. Hi Nina and thanks for sharing your method as I’m beginning my test of Springpad as a means to escape Evernote’s (IMO) poorly implemented feature overload which is now creating workflow drag and distraction for me. As for reminders/alerts inside a list manager such as Springpad or Evernote, after listening to the GTD audiobook for the seventh time, I finally decided to *do as David Allen says* which is to “Put all time-sensitive material into (my) calendar.” rather than use yet another reminders app. Now I have my G-cal send me one repeat daily email reminder: “Review your calendar” which also prompts me to browse my calendar and scan future events for Next Actions. Once per day My iPhone beeps, I get a popup badge and the all-in-one reminder is also in my email Inbox! This has rescued me from further stress in searching for the single magic app that will possibly never outperform separate, dedicated apps. I now run only a list manager and a calendar, BAM! Currently, email reminders are only supported by entering the event on the full web version of G-cal but hey, it’s a one time move that I am thrilled to to have made! Let us know how that works over time. I’d be curious to see if you get numb to that daily reminder, or if it helps you stick with it. Hi Evan, I’ve been using this single reminder for about one year and I rarely ignore it. I am more far more inclined to go numb to (and shut off) pestering alerts for several tasks. Thanks for letting us know, Ever-Not.